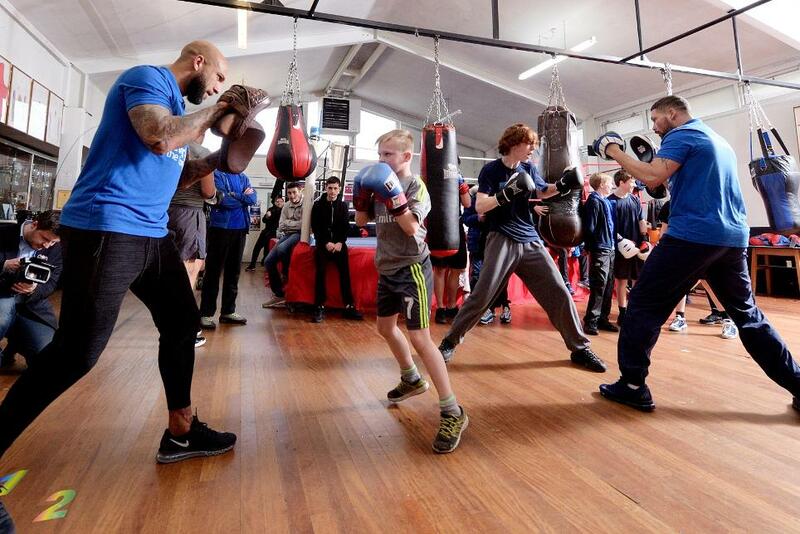 Everton's Tim Howard tried on a different set of gloves recently as he joined cruiserweight champion Tony Bellew in surprising young people taking part in the club’s Premier League 4 Sport boxing programme. The pair attended an Everton in the Community (EitC) PL4Sport session at Salisbury Boxing Club in the heart of Liverpool to see how the programme, which uses the appeal of clubs to keep young people active, is helping out the local community. "Programmes like this get these kids off the street and into the gym, gets them disciplined which all kids need today so it’s a good deed all around," said Howard, attending his final EitC session before moving to Colorado Rapids in the United States of America in the summer. "There's a huge positive in boxing, there’s goal setting and that determination and discipline that you need to become a champion and hopefully one of these kids has it." Bellew passed on tips before he and Howard donned pads and stepped into the ring to help the participants with their training routines. "These kids are from a deprived area, similar to what I am from," said EBU Cruiserweight champion and Everton fan Bellew. "I want them to be able to go to a youth centre, play football, table-tennis, pool and snooker and enjoy being a kid."